Successfully Added Mini Portable Multimedia Projector for Computers to your Shopping Cart. Attention: all Multimedia Projector fans, if you are looking for a high quality Mini Pico Projector that works directly with your laptop computer, then look no further than the Mini Portable Multimedia Projector for Computers from Chinavasion. This pocket-size mini multimedia projector is intelligently designed to use 100% USB power and the latest LCOD (liquid crystal on silicon) micro-display technology for high contrast images and robust colors. It is the perfect companion to your laptop or notebook for use at home to watch a movie or conveying ideas in a small group environment. Lighter than most cellphones and small enough to fit into a packet of cigarette, you can easily place it inside your laptop bag or unnoticeably slide it into your back pocket. While it is small and portable, it has enough juice to turn your 8 inch notebook screen into a massive 80 inch crisp clear projection to share with your friends, relatives and colleagues. Because the Mini Multimedia Projector does not require a normal power adaptor like others, it offers you so much convenience and freedom. How about view a Youtube video on the ceiling while you are lying on a bed, or watch a movie on the night of your hiking trip. 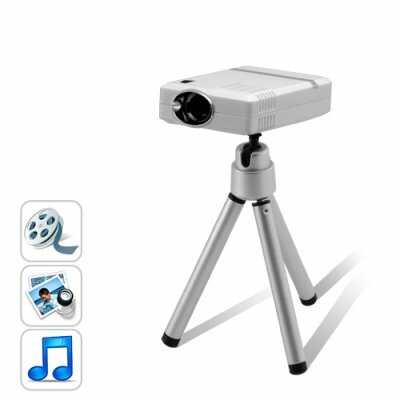 This featherweight, portable and fun mini projector is perfect for your personal/ office use and the resale market. It is offered at a fraction of the prices of similar "branded" mini projectors, plus it comes with our famous 12 Month Satisfaction Guarantee. Available only from the leader in wholesale electronics - Chinavasion. My computer with Windows 7 does not recognize this projector, how can I fix this problem? Your windows 7 may have problem of recognizing the removable disk that contains the software when you connect the projector to your computer. One way to get around this problem is to connect the projector to another computer with Windows XP/Vista, then copy to software installation file to the computer that you will be using , run the software and you should be able to use the projector under Windows 7. Is this projector the same as ones from 3M/Dell/HP/AAXA/etc ? Yes, but even smaller and only at a fraction of their price. Has this projector got VGA or AV inputs?